Many cat owners prefer to make their own cat litter, rather than buy the commercial varieties available at the store. 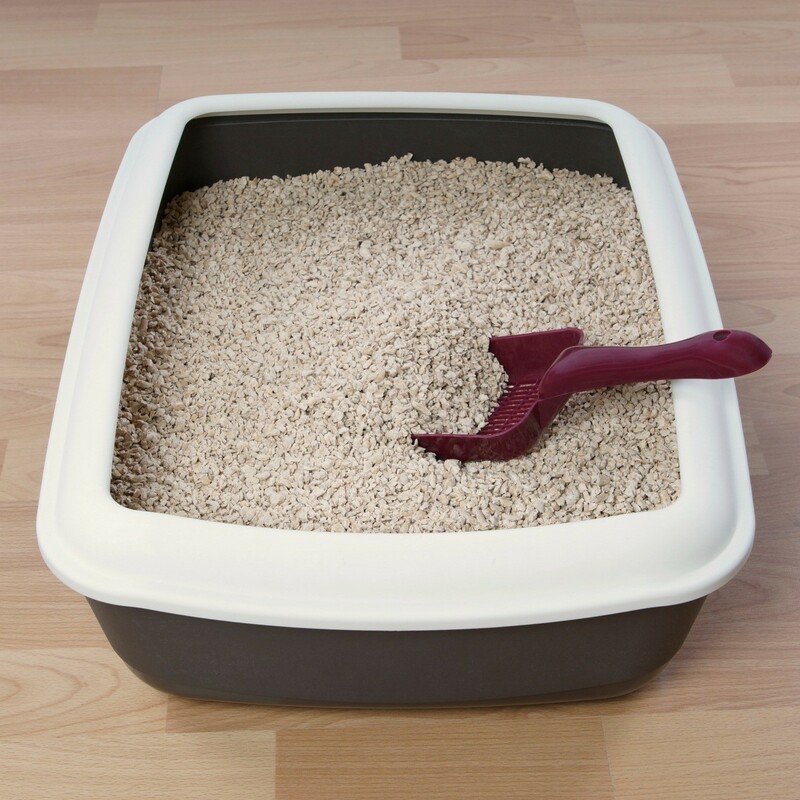 This is a guide about homemade cat litter ideas. Shred some newspaper and soak it in a Tbsp. of dish soap and water. Allow it to soak until the water gets dirty. Drain it off in a colander and re-soak it in plain water. Drain it again and mix in some baking soda. Squeeze out some of the water, breaking it up, and leave flat to dry for at least 48 hours. Now you have homemade cat litter. Please do NOT use Speedy Dry or any similar product as cat litter. At least some (if not all) of them have additives that may be harmful to or fatal for your cat. I foster so therefore have a lot of cats and am ALWAYS concerned with cost. I personally use pelleted horse stall bedding. It costs ~$6 for a 40 lb bag (at local Southern States or Tractor Supply). It's not the best at odor control and some of my cats don't particularly care for it but it's natural and affordable. It does NOT clump; in fact, just the opposite. Wet pellets break down into sawdust. You just have to scoop in reverse, shake out the wet and replace with good pellets. How can I make homemade cat litter? Chances are, your cat is already accustomed to the brand you're supplying at the moment. If you're lucky, it'll accept your substitute but if it's an older cat, chances are it's not going to like the change. I'm not sure of any homemade cat litter recipes that will get cats do their business on but have you thought of adding a filler like sand for example to make a bag last longer? Just a thought. Also, make sure you're using a covered litter tray so that litter stays contained. The waste from your cat digging adds up. Gradually replacing the old litter with added amounts of the new litter over time until it is eventually the only one will solve that problem. Hooded / "covered" litter boxes are not good for your cats respiratory health as they concentrate fumes and dust and force your cat to breathe them. It is also more difficult for you to see when the litter box matter needs attention. Hooded boxes are for the convenience of their person and they are definitly not preferred by cats! I use a large dog kennel as an enclosed litter box just take the gate off. there is enough air circulating through that the cat doesn't inhale fumes and quite enough room for the animal to turn around. Can someone advise me on how to make homemade cat litter? I found a great web site for making homemade cat litter. Try this homemade one, http://www.ehow  made-cat-litter. If you or someone you know is into woodworking or you have a sawmill locally. Sawdust works great. Fill you box with sawdust add some baking soda mix them together and you have cat litter. Is there a way to make cat litter -- or use something else in place of it that is inexpensive? Thanks! I make litter out of shredded newspaper. It is a lot lighter to get rid of and my cats (3) don't mind it at all. Shredded newspaper for sure! But there is a right and wrong way to do it. It must be shredded into thin long strips, use a home office paper shredder. You must use enough of it in the litter box, a big tangled mass to soak up the urine. With enough shredded paper and a little time (about an hour) the urine will get wicked up by the paper. Then, just dump the whole thing and replace with new. Solid waste can be removed by using a small plastic shopping bag or whatever as a glove, no need to change the whole box unless it is urinated in. I used shredded newspaper, and then I used yesterday's news litter when my cats were de-clawed. They were so mad about using the newspaper and the yesterday's news, they went to the bathroom outside of the litter box. As soon as I added the regular litter they went to the bathroom in their litter box again. I guess they did not like change. We have a cattery, and cat litter for over 10 cats gets pretty pricey. We also are very interested in our cat's health and avoiding problems caused by commercial products. We have found that both cracked corn (in feed stores or farm n fleet) for 6 dollars for a 50 lb. bag works great. Or, chicken feed for laying hens (same place and around the same price) is much more absorbent, clumps and absorbs odor, you can use both mixed together, or either depending upon your cats preference. Both are very soft and the cats love it- the feed is very scoop able and can be flushed easily (they both can) for odors, add 1/4 cup of baking soda to the bottom of the litter box before adding the litter. This sounds like a lot of great suggestions. I probably wouldn't use newspaper though, because the ink has lead in it. But, you can get newsprint, before the ink is put on it. My dad worked in newspapers, so we always had a roll of it, for drawing. Also, chicken feed can attract mice. We have an old chicken coop, and all the mice stayed out there, until the feed was gone. Of course the cats can catch the mice, but I don't want the mice in my house. Someone else asked about corn, if bugs would be attracted to it. I wonder about the pinto beans, too - interesting! How do you make clumping cat litter? Does anyone know how to make clumping cat litter? It is getting very expensive to purchase.